Free Direct Download Android Angry Birds Star Wars II From RevDl . The Force is strong with this one. Get ready for Angry Birds Star Wars II – the epic follow-up to the #1 smash hit game! Based on the Star Wars movie prequels, use the Force for good against the greedy Pork Federation or choose a much darker path. That’s right; for the first time ever you can “Join the Pork Side” and play as the fearsome Darth Maul, Emperor Palpatine and many other favorites! 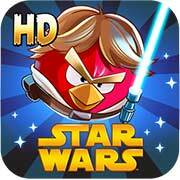 Hi admin… I Download mod apk File… and then i instal the apk… but why it just like normal Angry birds Star wars 2? am i must download 3 file or mod APK only? Works fine with an unknow google account. What have I to do to work mod with my account ? Good game and good website.